With over 3,543 kilometres of fresh water, seek out relaxation or invigoration … you decide. Uncover the perfect beach experience at the world’s second longest freshwater beach at Sauble Beach. Spend your day hunting for driftwood or for retail treasures on Sauble’s retro main street. Discover family activities galore, like Sauble Speedway or Giggles Arcade. If you’ve never had authentic Mexican food before, the double decker Casero Taco Bus will be a memorable culinary discovery. Gourmets will delight in the adventures that lie just down the road … or around the corner. Southampton beckons with a nautical sophistication and an abundance of ways to satisfy your appetites. The Art Gallery and Southampton Art School may inspire you to pick up a treasure or that brush that has been sitting idle. Shop fashionably at Sisters on Huron or gastronomically at The Cook’s Cupboard and the Southampton Olive Oil Company. Explore boardwalks and other trails far off the beaten path. Good cheer can always be found in the many shops, cafes and restaurants that await your discovery. Kincardine is a feast for the eyes, with lovingly restored century homes, spectacular gardens and a profound love for all things Scottish. Discover the joy of theatre at the Bluewater Playhouse, or make new friends at the Scottish Pipe Band Parade. Explore these charming communities with their deep marine heritage and love of good food. Each community has something a little different to offer so start your adventure, trailblazing Bruce County’s lakeshore. This is the place where historic exploration takes root. 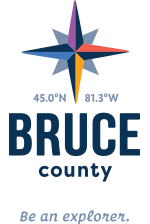 The Bruce County Museum & Cultural Centre is the place to search for the answers to all the questions you’ve collected during your Bruce adventure. Uncover stories and local lore about our marine heritage and learn more with family-friendly feature exhibits, programs and special events. There is no end to what you will see, do, learn and uncover at the Southampton Museum. The Museum is also home to the Bruce County Archives & Research Room. You just might stumble upon your own family’s roots from Bruce County’s bygone days. Do you know what a Blue Flag Beach is? Want to know more about the shipwrecks of Kincardine’s past? There is lots to unearth on Station Beach, Kincardine's main beach area. Shallow, with a gentle slope, it’s a perfect beach for little ones. Pull out your camera and strike a pose. A restored lighthouse watches over the harbour and the pier, providing an excellent place for a family photo op. If curiosity catches you, you’ll want to stop and learn about local shipwrecks through the beach area interpretive signage or at the base of the lighthouse in their museum. If you’re feeling energetic, you may want to partake in a game of beach volleyball or simply go for a relaxing stroll along the boardwalk, a route that extends from the harbour to St. Albert Street. After this day on the beach, you’ll be ready to discover a new restaurant or watering hole in Kincardine’s downtown – just a skip from the waterfront. And if you time it right for dusk, you may just experience the Phantom Piper that everyone is talking about. Hidden just off Sauble’s Main Street, this little gem of a mini golf course is a worthy find for families. The course is fun for kids of all ages and features creatively-themed holes featuring bathtubs, toilet seats and even a lighthouse! The giant plush puppy dog always brings a smile to everyone’s face, and the bonus end-of-the-course hole is everyone’s favourite. The grounds are well-cared for with everything freshly painted each year. Open daily at 10am starting at the end of June.